Crews insert an In-Line Inspection tool B header on the Valdez Marine Terminal. 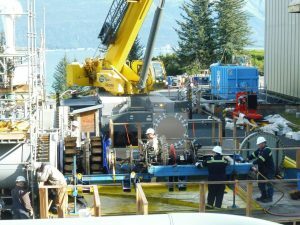 2018 marked the third and final year of the buried crude piping inspection project at the Valdez Marine Terminal, or VMT, culminating in the inspection of the 48-inch crude line “A” and “B” headers. This final stretch accounted for more than a mile of piping that carries oil across the terminal, from the East Metering building, up to the tank farm and down to West Metering. Until recent advances in technology, the piping was considered “uninspectable” and had not been internally inspected since construction. Over the last two project seasons, personnel had inspected piping under the East Metering building, the relief piping from East Metering to the East Tank Farm, and crude piping from West Metering to the end of berths 4 and 5 with smaller crawler pig tools. They also prepared the facility for inspections with the larger in-line inspection pig by taking out short 90 degree bends in the piping and valves too narrow to let the tool through, and reinforced the foundation of the area where pig launchers and receivers were installed this summer. Things kicked off in earnest during the June 36-hour pipeline shutdown. The facility was a hive of activity while alternating oil movements between headers from East Metering through the relief piping and tanks and then to storage tanks. This allowed crews to cut pipes and install new valves and pig launchers and receivers at East Meters and West Meters, respectively. With the required infrastructure in place, personnel routed 19 pigs through A and B Headers over a 33-day window in July and August. The project team had to work with oil movements and operations to coordinate the pigging around shipping windows. To ensure the piping was free from wax, 15 cleaning pigs were routed through the headers. After the cleaning pigs, crews sent two 48-inch tools through each header. One measured metal loss and wall thickness; the other could detect dents and other deformities in the pipe. The data received from the tools indicates the pipe is in good condition, and the system returned to service. There were no injuries or spills during the course of the project. Photo and information courtesy of Alyeska Corporate Communications.